The possession and use of illegal substances is not just a health problem, but also a safety problem, especially in schools and businesses where the potential for negative consequences is high. K-9 SEARCH & DETECTION, LLC can help you take a pro-active stance in minimizing the presence of illegal drugs and preserving the safety of everyone involved. 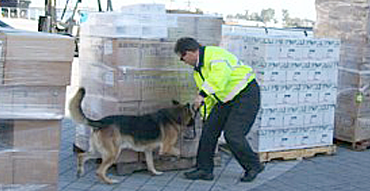 Not only do the K-9 teams search for and detect contraband, but they also serve as an effective deterrent. Individuals carrying illegal substances will often avoid a location when our drug sniffing dogs are on watch. Assisting in creating a drug free school ensures a more safe and secure environment for both teachers and students. We can inspect vehicles, classrooms, lockers, and all areas of school property. For businesses, this service can improve productivity and decrease the liability of work place accidents. It also demonstrates a commitment to the well being of employees. Using drug sniffing dogs for random searches limits the intrusiveness on employees and has little impact on daily activity. Another benefit of narcotics searches in the workplace is saving on workers comp and insurance claims.